Save Huge at Our Toy Hauler Overstock Sale! The 2019 model year RVs are arriving, and we need to make room on our lot! So right now, we, here at AC Nelsen RV World, you will find huge savings at our Toy Hauler Overstock Sale where you can save thousands on top brand toy hauler recreational vehicles. Take a look at a few of the floorplans available and start living the RVing life today! Save thousands at our Toy Hauler Overstock Sale! In this Overstock Sale, you will find not only brand new 2019 and 2018 toy haulers, but there will even be a select few 2017 models. With the best manufactured RVs from Coachmen, Forest River, Heartland, Palomino, and RiverStone, there is certain to be a style and brand perfect for your family and your budget. You can even choose between travel trailers and fifth wheels! Find the web’s best prices on our Toy Hauler Travel Trailers! 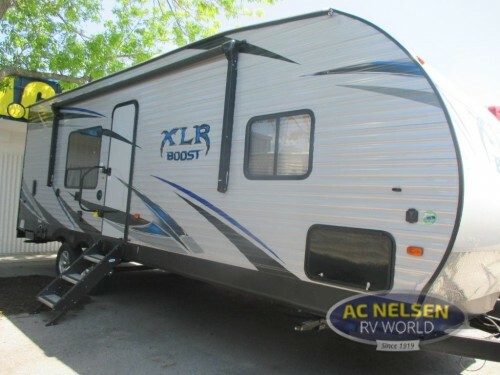 For example, one of the toy hauler travel trailers we have for sale is this 2018 Forest River XLR Boost 27QB. At a price of just $24,988, this is the best price on the web with a savings of over $14,000! This amazing camper with its dual rollover sofa, removable free-standing dining table, and queen master with a private entrance to the bathroom is perfect for a family of six to have more adventures and more memories than ever. Enjoy more luxury for less with our Toy Hauler Fifth Wheels! 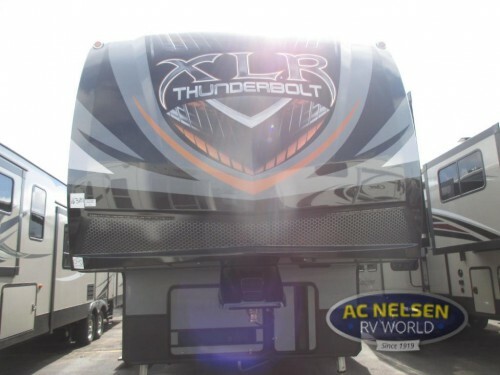 We’ve also got toy hauler fifth wheels like this 2018 Forest River XLR Thunderbolt 341AMP. With a savings of over $43,600, you will be shocked at how many luxury amenities you will get. From the king master bed to the convertible garage complete with electric bed, loft, and TV and washer/dryer prep station, every area will provide more comfort to the campground. At our Toy Hauler Overstock Sale, you can get the same great RV for a fraction of the regular cost. But this sale will not last forever, so hurry up and contact us or come down to our location today!